Jigme Droden Dorji, the Third Padtselling Trulku was born in 1853 (Water Ox Year) at Nagtshang. His family belonged to the Jakar Dung, nobility descending from both Pema Lingpa (1450-1521) and Lhalung Pelki Dorji (8th century). His other name was Jigme Drodul Dorji. The boy was recognized as a young child as the Third Padtselling Trulku, the immediate reincarnation of Jigme Tenpai Gyaltshen (1788-1850). He was installed at Jangchub Pelri Gonpa, seat of the Padtselling Trulku. A disciple of Jigme Tenpai Gyaltshen, Lama Kunzang Dechen who was a regent (latshab) and other lamas taught him the lineage teachings. 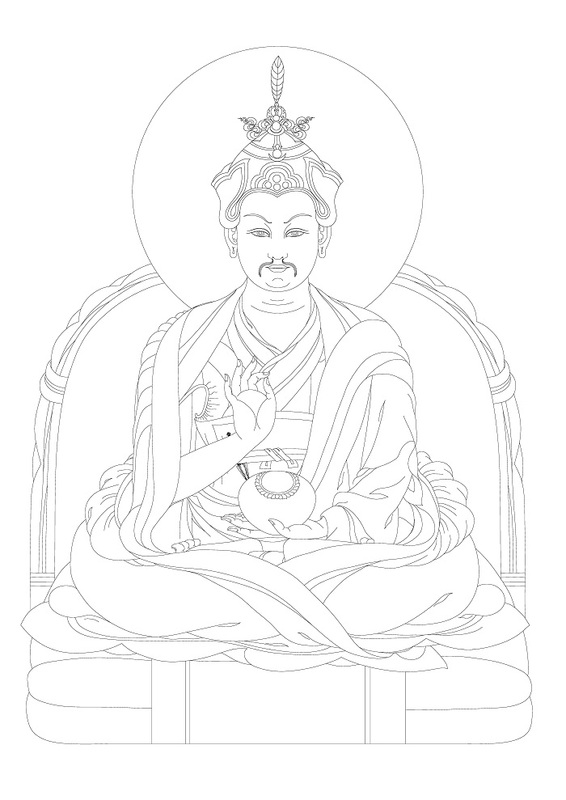 He received empowerments, transmissions, and instructions central to his lineage, such as the treasure teachings of Drime Lingpa (1700-75/6), Longchen Nyingthig, Peling Chokor, and Ratpur, the Phurpa teachings of Ratna Lingpa (1403-1478). At one time in the past, Lama Tshogdu Rangdrol of Dokham prophesied Bhutan to be the place for one of his accomplished students for practicing his teachings. Accordingly, the student arrived at Bumthang to find the place via Lhodrag. From there he went to Kurtoe Takeyla. Unable to find the prophesised place the student passed away. His reincarnation Choying Rangdrol was born to the descendants of Guru Chowang (1212-1270), the treasure revealer of Nyalamdung in Lhuntse. This reincarnation went to study under Drupthob Nangzey at Khenpajong and later under the Third Padtselling reincarnation Drodul Dorji whom he made as his root lama. Choying Rangdrol became Jigme Droden Dorji’s most illustrious disciple. After completing his education and following his root lama’s prophecy, Choying Rangdrol established Gonpa Karpo at Lhuntse, a replica of Padtselling Gonpa, and instituted the religious tradition of Drime Lingpa, known as Dorji Sokdrub. The gonpa is also known as Kaba Gonpa since it was built by the command of his root lama. Jigme Droden Dorji had two sons by a consort. He died in 1883 at the young age of thirty at Ta Gamling.